The exceptionally vicious U.S. condemnation of Israel with regard to housing construction in the Jewish neighborhoods of Jerusalem is not merely misguided, but also reflects irrational bias. Incidentally, this behavior also has many ominous parallels to the inhumane incarceration of Jonathan Pollard, despite pleas for his commutation from all sectors of American society. The harsh outburst relates to a 2,600-unit housing project planned as an extension of an exclusively Jewish neighborhood adjacent to the suburb of Talpiot and Kibbutz Ramat Rahel both within the Green Line. It incorporates primarily barren land on which Ethiopian and Russian immigrants had been housed temporarily in mobile homes. Highly significant – but a fact that is ignored – is that nearly half of the construction was designated to provide housing for Arabs. Construction permits were approved two years ago but it was the far left-wing group, Peace Now that saw fit to highlight the issue in a press release on the eve of Prime Minister Benjamin Netanyahu’s meeting with U.S. President Barack Obama in a calculated effort to embarrass the prime minister and provoke tensions. The successive statements by both the White House and State Department spokesmen must be considered among the most bitterly prejudiced and unbalanced condemnations of Israel ever expressed by the U.S. 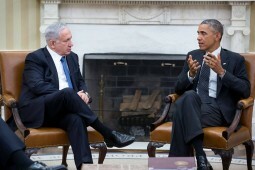 They make a mockery of repeated claims by the Obama administration that it considers Israel to be a close ally. U.S. State Department spokeswoman Jen Psaki took it even a step further and said that these construction plans would “call into question Israel’s ultimate commitment to a peaceful negotiated settlement with the Palestinians.” This outrageous remark will be seen as an attempt by Obama to reassure Palestinian Authority President Mahmoud Abbas that he would still stand by the Palestinians, despite condemnation of Abbas’ disgusting U.N. speech, which was also a slap in the face of the U.S. This was clearly a crafted position. The U.S. is fully aware that the location for this construction is in the heart of Jerusalem’s Jewish neighborhoods and will always remain under Jewish sovereignty. They also conveniently overlooked the fact that this particular project was to include Arab housing. To compound matters, the administration also condemned the legitimate purchase of seven residential homes by Jews in the Silwan Arab neighborhood of Jerusalem. In so doing the Obama administration is endorsing the PA’s policy of preventing Jews from buying homes in Arab-populated areas of Jerusalem. This, despite the fact that Arabs live freely among Jews in west Jerusalem and throughout Israel. The U.S. is therefore validating the “Judenrein” ethnic cleansing policies of Abbas, who had the gall to accuse Israel of being an apartheid state in his recent belligerent U.N. address. They went so far as to convey the message to moderate Arab states that Israel is “poisoning the atmosphere,” discouraging them from reciprocating Netanyahu’s efforts to reach out and develop a new relationship with them. The bitter attack on Israel for construction in the Jewish neighborhoods of its own capital is unique not only because of the disproportionate ferocity of this public condemnation of an ally, but also when viewed in the broader context. Setting aside the Gaza war and the histrionic attacks against Israel by Abbas at the U.N. General Assembly, it is impossible to comprehend such a reaction against the backdrop of regional events. Entire countries — Iraq and Syria — are imploding; literally millions have been displaced from their homes and become refugees; over 200,000 were murdered in Syria alone; barbaric decapitations of innocent people which are publicly circulated on the Internet. Yet, it is against the background of this maelstrom that the U.S. sees fit to condemn and isolate its most devoted ally, the sole democratic state in the region and the only place where chaos does not prevail. Why? Because two years ago, the municipality of its capital, Jerusalem, approved a housing project in a Jewish neighborhood (which would also provide housing for Arab residents). The irrationality and severity of these rebukes of Israel, encouraging other “friends” to join in the condemnation, suggests that Obama remains obsessively determined to force Israel to adopt his approach. And this, despite the events of recent months and his own admission in his U.N. speech that he had hitherto erred in asserting that the Israeli-Palestinian conflict was a major impediment to regional stability. No responsible Israeli government could ever contemplate acquiescing to such demands. We must never apologize for building homes in Jewish Jerusalem and there is an element of insanity in the U.S. condemning us for doing so. Netanyahu speaks on this matter on behalf of the entire nation. This is not the approach of a particular government. It reflects the consensus — other than the extreme left-wing Meretz and marginal post-Zionist groups. This is a time for us to stand up and be counted. Opposition Leader MK Isaac Herzog should speak up as a genuine Labor Zionist leader and state that his party is at one with the government regarding construction in Jerusalem. Should he fail to do so, he will be turning his back on the Labor Zionist ideals of Israel’s founders and his Labor party will become a discredited delusional left-wing marginal group. The response of the American Jewish leadership is also crucial. They have until now displayed a reticence to respond publicly to biased statements on Israel expressed by Obama. But this will put them to the test. If the leaders fail to speak out against such a vicious attack which effectively encourages other countries to join in exerting pressure on Israel, it will be perceived as dramatic erosion of their political influence and their community standing. The American Israel Public Affairs Committee should now actively launch a public information campaign, speak out robustly about Israel’s rights in Jerusalem and make a concerted effort to canvass support from members of Congress. If Obama can behave in such a contemptuous manner towards Israel five weeks before congressional elections, one is left with a chilling feeling that we may see even more unfortunate initiatives during the remaining term of office of this president who seeks to distance himself from Israel as he simultaneously engages with rogue states and appears determined to rehabilitate Iran. Isi Leibler’s website can be viewed at www.wordfromjerusalem.com . He may be contacted at ileibler@leibler.com . Copyright © 2019 Isi Leibler. All rights reserved.